One Friday morning in March, in front of twenty or so amazed onlookers, a two-foot-tall humanoid robot named Eve lurched, arms swinging, into Michael Jackson’s Thriller dance, then after a pause, gracefully performed tai chi. The room erupted in applause. The witnesses to Eve’s performance were educators—teachers, administrators, and IT staff—who had joined hundreds of their colleagues on the campus of New Jersey City University (NJCU) for the NJEDge Faculty Showcase, an annual event featuring trends and best practices in educational technology. While they clearly made an impression on those in the room, Eve’s slick moves weren’t nearly as audacious as what had preceded them. For the better part of the session, presenters Dr. Laura Zieger, a professor and Chairperson of the Educational Technology Department at NJCU, and Sofia Levchak, a doctoral candidate, had followed through on the promise of its title: “Humanoid Robots in the Literacy Curriculum.” They had attempted to explain how a dancing robot could help teach students to read. Researchers are exploring how new technologies & tools, such as NAO, can help improve student literacy. The robot in question is a NAO, one of three models produced by the French firm Aldebaran. With a diminutive stature, rounded features and childlike voice designed to engage, the robot is gaining traction as a teaching tool. And while the programming the robot requires points to its use in STEM (Science, Technology, Engineering, and Math) education, a small body of research suggests humanoid robots could actually be used to improve literacy. In one study Levchak cited, students in Japan increased their English vocabulary at a greater rate when attempting to teach a lesson to a NAO than when observing a teacher. In Madrid, students programmed two NAO machines to perform a scene from Hamlet. The idea, Levchak explained, was that students first had to understand the language of the scene before they could program text-appropriate motions in the robots. For Levchak and Zieger, NAO as a literacy tool is anything but a novelty. In fact, it’s the subject of Levchak’s dissertation. A reading intervention specialist, Levchak is also in the second year of NJCU’s emergent educational technology leadership doctorate program. Although her thesis is still taking shape, she hopes to assess NAO’s utility in an ESL setting. Levchak herself admits she had doubts about NAO before she delved into the research. Zieger, who chairs NJCU’s ed tech department and helped create the doctorate program, won’t mind if her protégé’s work at first raises eyebrows. Innovation, she says, is a key component of the Jersey City school’s program. “We really try to look at this as an ecosystem approach,” Shamburg says. “How will that technology fit into the ecosystem of the school? What are the training and professional development needs? What infrastructure is required? What’s the curriculum? What do the students need?” Extending the analogy, Shamburg says new technologies are akin to an invasive species. The invader might seamlessly integrate and thrive in its new environment, or it might die off quickly. Worse yet, it might cause wide-ranging disruptions. New technologies, similarly, can eat up valuable classroom time in set up and troubleshooting or place additional strains on over-burdened teachers, all without necessarily adding value. Worse still, they may distract students, engaging them in disruptive ways. Because budget is a primary concern for so many educators, Shamburg says he tries to promote affordable technologies. 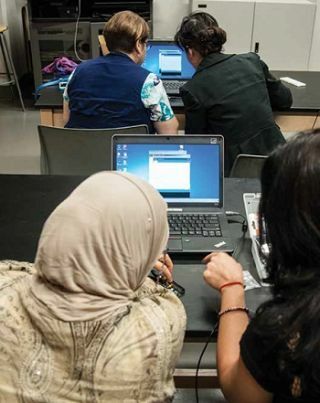 One of NJCU’s graduate courses, called Authoring Tools, explores DIY approaches to digital media using cheap or free software and athand technologies. “You could probably get through that entire course with your computer’s microphone,” he says. E-textiles are one of the emerging ed tech trends Shamburg favors precisely because of their accessibility. Combining newly affordable materials like conductive thread and flexible circuit boards with the contents of a sewing kit, e-textiles allow children to sew basic circuits and sensors into clothing, creating wearable technology. NJCU’s ed tech department runs a wearable technology pilot program, working with educators around New Jersey to figure out how e-textiles can be used effectively in K-12 and college classrooms. This kind of fieldwork, Shamburg notes, is part and parcel with keeping ed tech doctoral candidates grounded in the day-to-day realities of education. For some of the program’s doctoral candidates, making the rules can be an intimidating prospect. Levchak admitted to feeling somewhat exposed by the degree to which NJCU’s program is advanced in the field. If doctoral candidates feel exposed or isolated, Zieger says, that’s by design. The NJCU program is conducted primarily online. Candidates are only required on campus for one week each year. It may seem counterintuitive given the hands-on nature of the material, but Zieger says the 51:1 schedule has specific goals. One is that the program’s participants get to experience first-hand the isolation attendant to online learning. Graduates who go on to work in online or distance-learning environments will have learned exactly what kind of support online students require to overcome their isolation. She knows, having earned her own EdD at California’s Pepperdine University. Though that program requires more face-to-face time than NJCU’s, Zieger says, it includes extended periods of distance learning—enough to give her great insight into the experience. Members of NJCU’s Educational Technology doctoral program preparing for leadership roles. “You have to build into your program a sense of community and a sense of belonging and interaction and particularly feedback,” Zieger says. To that end, NJCU’s program is cohort based. Candidates enter each year in groups of twenty. They meet online before being thrown together in their first oncampus week for an intensive session of course work and group projects. The experience, Arsiwala and Levchak agree, forges strong bonds among cohort members that carry through once the week ends. From that point on, students are conducting research and completing coursework independently, but they’re not alone. In addition to the required one week on campus, NJCU faculty offer regular meet-ups on campus to introduce new technologies to the students. Attendance is optional, which puts the onus on students to take shape the course of their own learning, Levchak says. The hope, Shamburg says, is that forcing students to work in relative isolation and seek out their own support will foster the independence they’ll need when they finish the program and step into leadership roles. According to Arsiwala, it’s working. “It gives us the confidence that we can figure this stuff out on our own,” she says. David Zuckerman is a Brooklyn, NY-based writer and frequent contributor to AV Technology magazine.